Aliens, a Net Entertainment (NetEnt) slot based on the aliens theme, challenges players to achieve levels and win big prizes. One of the most thrilling and action-packed slots in the NetEnt portfolio, it dares players to win much more than the top fixed jackpot of 1,000 coins. Aliens slot has 15 fixed paylines. This means that players cannot manually activate them; they have to play all the 15 paylines. Players can bet up to 10 coins per payline and choose from coin values that range from $0.01 to $1.00. The betting range for Aliens slot is therefore $0.15 to $150.00. Once players have placed their bets, they need to hit the Spin option to set the reels spinning. They will get paid if a winning combination of symbols is displayed on the reels at the end of one spin. NetEnt’s Aliens slot is based on an alien-themed film that was produced in the mid eighties. The movie, which was meant to be the sequel of another popular alien-themed movie that was released in the late seventies, was directed by James Cameron and starred by Sigourney Weaver. NetEnt decided to release a slot based on the movie as its popularity has not reduced over the years. The reels feature symbols that have been directly lifted from the movie, along with audio effects and graphics that remind players about this movie. Aliens slot comes with a wild icon that helps players complete winning combinations and win attractive payouts. The slot is played in three levels—Level 1: The Search, Level 2: The Encounter, and Level 3: The Hive. In the first level, the wild symbol appears only on the second, third, fourth, and fifth reels. In the second level, it appears at random anywhere on the reels. Level 1: The Search includes nine steps and an alien activity meter. 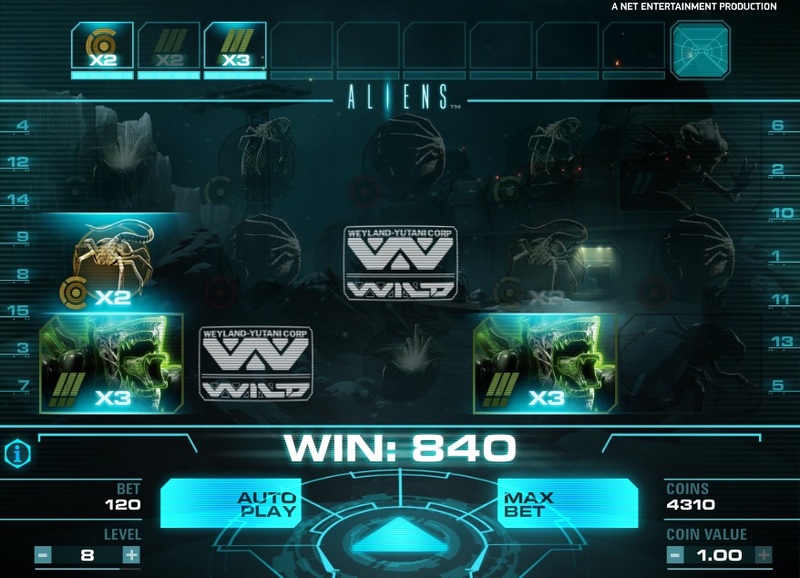 Whenever players create a winning combination, the symbols are represented in the alien activity meter and the multiplier is increased by 1. As soon as players complete all the nine steps in this level, the second level gets activated. All the multipliers that players have earned in the first level will be moved to the second level. Level 2: The Encounter comprises a rifle, a reel with Ammo icons, another alien activity meter, and an Ammo Clip Counter. Players need to complete 10 steps to reach the next level. Level 3: The Hive, which gets activated as soon as players complete the previous level challenges players to destroy the alien hive before the ammo gets exhausted. The aim is to destroy the Alien Queen and win the top prize of x240 their bet amounts. NetEnt’s Aliens slot is available in the fun and real play modes at any online casino powered by NetEnt software.